I was born in Chamberlain, SD, and spent the first 10 years of my life in various small towns in SD. Both of my parents, John and Beverly Reimer, were teachers. Together they had 3 daughters, Karla, Trish and myself. Our mom stayed home to raise the family, and Dad was teacher, principal, superintendent and coach of almost everything!! We moved to Ellsworth, MN when I was 10, and then to Pillager, MN when I was a sophomore in high school. Dad was principal there, as well as coaching football, basketball, track and field, and wrestling. Needless to say, his love and passion for sports was passed on to his 3 girls, as we all went into teaching and coaching!! It was the era of Title 9, so I had the opportunity to compete in basketball, volleyball, and track and field. In my freshman year, we played 6 person basketball, with 2 rovers, 2 offensive and 2 defensive players. I was quick and a pretty good shooter, so I got to play rover. (A good thing, as I am not sure I could have stopped at the center line as the offensive and defensive players had to do!!) By my sophomore year, they had changed the rules to 5 person basketball, utilizing the entire court. At that time, basketball was played in the Fall because of gym space. We played volleyball in the winter, when there were gyms available. In track and field, girls could not run farther than 880 yards and we had a softball throw instead of the shot put. My how things have changed!! I received All-Conference honors in basketball, volleyball and track and field. I hold the 100 yard dash record (set in 1973, retired since it is yardage!) I was a State Competitor in the long jump in 1973, when it was a one class system. I also hold the 3 year scoring record for basketball. I was very blessed to have parents who believed in girls’ athletics early on, and to be able to compete with both of my sisters on all of these teams!! I graduated from Bemidji State University in 1977 and competed on the basketball team, as well as being captain of the track and field team. I am married to Chuck Morgan, and together we have a blended family of 5 children. My son Nate and daughter Taylor, my stepchildren Conny, Pat, and Ryan, son-in-law Jared, and grandchildren Cassidy and Jack are all so dear to us!! I have been coaching for 41 years! It has been a privilege to work with these fine young people! COACHING EXPERIENCE: Brainerd 1977, Staples 1977-79, Parkers Prairie 1979-1982, Breck 1984, Minnetonka 1985-present. I grew up in a suburb of Chicago, Illinois where from the age of 13, I actively participated in Track and Field, Cross-country, and Gymnastics. I was blessed to have a supportive family, and a father that was my High School track coach. Currently I live in Mound with my husband of 21 years Peter and our 3 boys Bjorn , Anders, and Nels . (Yes we are Swedish!). Besides coaching, I teach a 3 yr old class and pre-K class at Excelsior Covenant Preschool. The highlight of my summer for the past 10 years has been to lead a children’s program on an annual mission trip to Pine Ridge Indian Reservation. I have been coaching track and Field at Minnetonka H.S since 1992. Qualified 1 week summer camp @ the Olympic Training Center in Colorado. Letter winner/ competed on their travel team for 3 years. I grew up in a small farm town called Pierz, MN. I have 3 younger sisters and best friends: Kaley, Kaitlyn and Kaari, perfect for a relay team! My entire family is made up of coaches: Both my parents, grandparents, aunts, brother-in-law and sister, I guess you can say it is in our blood. I remember when I was a little kid going to the All Comers meets with my family or to the track with my grandpa Poppie to practice the hurdles, what fun memories! In high school I competed in Tennis, Dance, Track & Field and an occasional Cross Country meet (our school was so small that they needed extra people to fill out the team!). In track I was a hurdler and jumper. I was 3 time MVP in track and 2 time MVD (yes that is Most Valuable Dancer) on the dance team:) I didn't find my love for distance running until I became a Cobber at Concordia College in Moorhead, MN. After competing in the heptathlon my freshman year, one of the upperclassman told me I was a "distance runner in denial". I decided to join cross country my sophomore year and it was one of the best decisions I've ever made! I love cross, it is such a fun family atmosphere, so when I had the chance to coach after college, I was obviously excited to pass on the love of the sport. I was fortunate enough to coach in Becker with my Aunt Tricia in 2005 and in Minnetonka with my Aunt Jane in 2009/2010 both CC and Track. I am so excited to be back again this year! As long as I can remember, I have loved running…Fast, slow, short distances, long distances. I am excited to be coaching, allowing me to combine my love of running with my passion for young people. I thoroughly enjoy being around their energy, enthusiasm, and zest for life. I was inspired by my Dad who was an amazing runner in his high school days in the upper peninsula of Michigan. Wanting to follow in his footsteps, I ran for Eden Prairie in both middle school and high school, enjoying many successes along the way. After high school, I decided to run road races as my life allowed, spanning all of the distances…marathons, half marathons, 10-milers, 10Ks, and 5Ks. Running in races is something that I continue to enjoy. I have my Master’s Degree in Education and am licensed in secondary Life Science, but have chosen to work in the corporate world in the medical device industry which affords me a flexible schedule. I have two awesome daughters who go to Minnetonka Schools, Kate and Kira, and am married to my middle school sweetheart, Eric. I grew up in southwest Minneapolis and moved out to Minnetonka when I was entering the 10th grade. I have been active in sports my entire life and thanks to Title IX, I was able to participate in high school sports. I was on the first Girls Soccer Team, the first Nordic Ski team and the first Girls Fast Pitch Softball team at Minnetonka. I also played on the University of Minnesota’s Club Soccer team before the U had a Varsity Soccer program. My love of sports has followed me throughout my life. 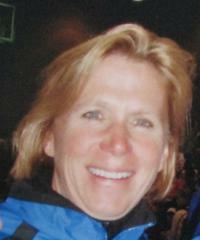 I have been a coach since 1982 and have coached track, soccer, softball, adapted floor hockey and adapted softball. But the most rewarding coaching position I have held has been as an Assistant Girls' Cross Country Coach. I have been an active part of the Minnetonka Team since 2002. Coaching Cross Country is a highlight of my year, I feel so blessed to be a part of this team. The girls are so kind and work so hard, I love watching the girls push themselves to become stronger athletes. By the way, I am the one on the bike. I am entering my eighth year teaching 6th, 7th and 8th grade Physical Education at Minnetonka Middle School East. This is my first year as Head Girls Cross Country Coach at MME and third year overall. I also am the Head JV Basketball and Softball coach here at Minnetonka. I'm proud of creating our school wide initiative, "Do the Right Thing," and look forward to building upon that program. I grew up in Hutchinson Minnesota where I played both basketball and softball and continued playing in college at Minnesota State University-Mankato. Sports have been a huge part of my life and staying active is a passion of mine. I recently completed my first half marathon up in Duluth and running has become a daily part of my life. I look forward to continuing working with young athletes as I believe there is much value in teaching life lessons through sport. Lisa is in her sixth year working for Minnetonka. The past five years she has taught 6th grade STEM & 8th Grade Computer Science at both MME and MMW. This year she will continue to serve both middle schools as the Tonka Makers and Coders Coordinator, working with both teachers and students to enhance this initiative. Lisa was a tri-sport high school athlete and has taken up a love for running in the recent years, its a great way for her to get some "me" time with two boys, 4 & 6, at home. She is excited to head the MMW middle school girls team for the second year this fall.